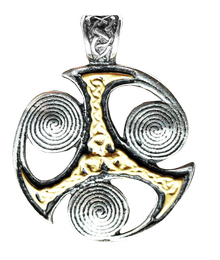 An ancient Universal Symbol, the Triskilian is set among three spirals of continual motion, which signify the three Realms of Being and is said to create Opportunities. 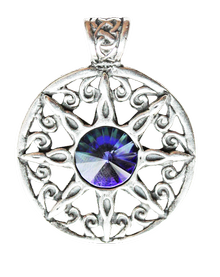 The star design shows the eight winds and eight worlds of ancient belief, with our world - Midgard - shining at the centre of creation. 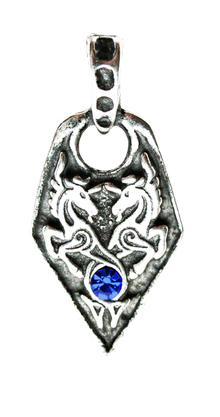 This pendant is reputed to promote leadership and advancement. Two mythical Unicorns rise from the sea foam, enchanting with their supernatural Beauty and Purity. The Sea Unicorn symbolises a Free Spirit and represents Love and Courage. 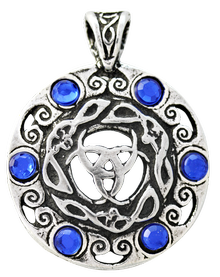 The Moon’s phases govern the Shamanic magic called Seidr, taught to Odin by Norse goddess Freya, which has inspired this charm said to promote Clairvoyance and Psychic Ability. 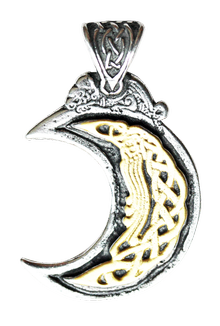 The Valknutr represents Odin’s power, while the lunar symbolism stands for Freya, Norse goddess of magic who taught Odin secret skills. 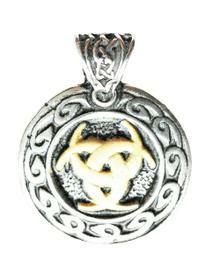 This pendant is worn for realising one’s dreams. 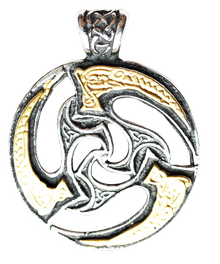 The Dolphins represent Harmony and Spirituality while the traditional Triskilian design shows the three Realms of Being. 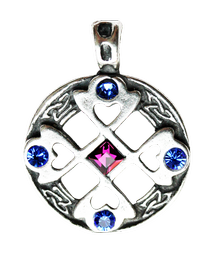 This charm may be worn for Guidance and Inner Peace. One of Mankind’s oldest symbols, the Sun-Wheel is the whirling unstoppable power of the Sun, shining in Splendour and Glory, and is said to promote Wealth and Success. 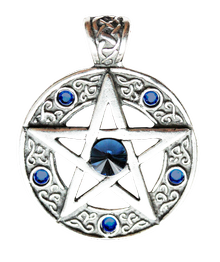 The magical Pentagram encircled and enhanced by Celtic knotwork is the traditional amulet of the Celtic Magician and was worn for achieving Will Power and Success. The man in the moon in Norse myth was Mani, who shone with the light of Not, Viking goddess of the Night. 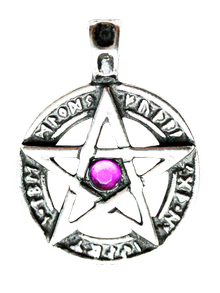 This charm is reputed to attract beneficial change and inspiration through dreams. 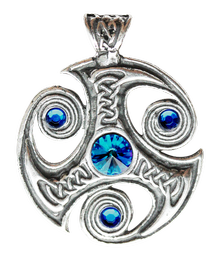 The ancient Norse believed the world was created of five elements: Air, Fire, Water, Earth and Ice. 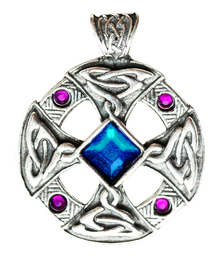 The Ice Dragon symbolises their combined energy and is a symbol of harmony and stability. 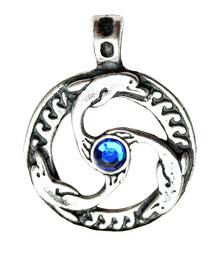 An ancient Universal Symbol, the Triskilian is set among three spirals of continual motion. The Isle of Man has adopted this emblem as its own and, when worn, stands for Optimism and Progress. The circle symbolises the Kingdoms of Earth and Spirit, while the Cross represents the dominion of God. The Celtic cross is worn for inspiration and intuition. 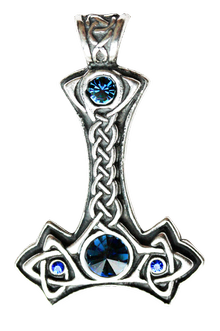 Viking God Thor’s Magical Hammer is an invincible weapon of supernatural strength, was worn as a powerful Amulet for personal and psychic protection.